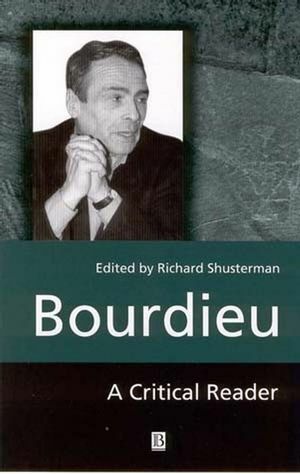 This Critical Reader provides a new perspective on the work of France's foremost social theorist Pierre Bourdieu, by examining its philosophical import and promoting a fruitful dialogue between Bourdieu and philosophers in the English-speaking world. The contributors include leading philosophers who critically assess Bourdieu's philosophical theories and their significance from diverse philosophical perspectives to reveal which dimensions of his thought are the most useful for philosophy today. These discussions also raise important questions about the current institutional limits of philosophy and how those limits may be overcome through a more robust alliance with the social sciences and the practical social world. The contributions cover Bourdieu's use of central figures in the Anglo-American philosophical tradition; his relationship to analytical philosophy and pragmatism through his concept of habitus; his position in twentieth-century continental philosophy; the political dimension of his work; the function and limits of his notion of "the field"; and the relation of his explanatory models to new directions in the philosophy of science. The book also discusses some of his most recent writing not yet translated into English, and it concludes with a chapter by Bourdieu in which he analyses the diverse structural problems and the transformations involved in importing intellectual ideas from one national field to another. The volume also offers a specially prepared comprehensive bibliography of Bourdieu's publications in French and English from 1958 to 1998. Richard Shusterman is Professor and Chair of Philosophy at Temple University, Philadelphia, and Directeur de Programme at the Coll&egravege International de Philosophie, Paris. Educated in Jerusalem and Oxford, he was a Fulbright Professor of Philosophy in Berlin. His books include Analytic Aesthetics (1989), Pragmatist Aesthetics (1992), Sous L'interpr&eacutetation (1994) and Practicing Philosophy (1997). Introduction: Bourdieu as Philosopher: Richard Shusterman. 1. "Bourdieu and Anglo-American Philosophy": Richard Shusterman. 2. "To follow a Rule": Richard Schusterman. 3. "Rules, Dispositions and the Habitus": Charles Taylor. 4. "Pierre Bourdieu: Habitus and the Logic of Practice": Joseph Margolis. 5. "Can there be a Science of Existential Stucture and Social Meaning? ": Hubert Dreyfus and Paul Rabinow. 6. "Theory in Practice": Louis Pinto. 7. "Peformativity's Social Magic": Judith Butler. 8. "Practical Reason and Cultural Constraint: Agency in Bourdieu's Theory of Practice": James Bohman. 9. "A (neo) American in Paris: Bourdieu, Mead and Pragmatism": Mitchell Aboulafia. 11. "Bourdieuean Dynamics: The American Middle-Class Self-Constructs": Chuck Dyke. 12. "Bourdieu on Art: Field and Individual": Arthur Danto. 13. "The Social Conditions of the International Circulation of Ideas": Pierre Bourdieu. * Provides a new analysis of Bourdieu's work from various philosophical perspectives. * Introduces Bourdieu's most recent philosophical writings which have not yet been translated into English. * Includes a new essay by Bourdieu.